The Fortune 500 is our biggest and best-known list of the year, for good reason—it’s 63 years old. Since its founding in 1955, the franchise has been a benchmark for companies to evaluate their success. Is your company a Fortune 500 company? If your annual revenue was big enough to put your company among the top 500 in the U.S., the answer is yes. 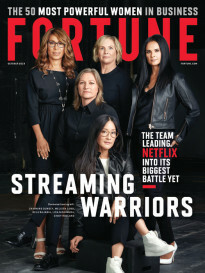 Today’s Fortune 500 is a multi-platform enterprise spanning print, digital, video, and live experiences, but it all started with the magazine. Our annual Fortune 500 issue is typically our thickest of the year—the business equivalent of a fashion magazine’s September issue. As such, there are special design elements in the issue that you won’t find in any other. Among them are what we call “inside covers”—alternate designs printed on cover stock but bound deep inside the issue. This year’s issue featured four inside covers. In previous years we commissioned completely different covers. (In 2014, for example, inside covers featured the “500” logo painted across a stack of shipping containers, as an abacus, and submerged in oil, among others.) This year, we decided to commission a multi-layered “500” logo that we could unpack across the inside covers. Fortune creative director Paul Martinez says each layer was intended to represent a different industry. 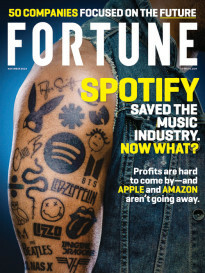 The visible layer of the “500” logo on the actual cover of the issue represents the technology industry; you can see a digital display on the top and ports along the side. The first inside cover shows a layer representing the energy industry, with each digit serving as an offshore oil rig; the second represents the airline industry with the digits serving as baggage claim; the third nods to the construction industry, with a three-stage build; and the fourth is for food, with three breakfast cereals in uniquely shaped bowls. And why a blue background? Simple, Martinez says—it pops on the newsstand.